As mentioned in my previous post, I spent some time in New York City this past Sunday. Seventeen-and-a-half hours, to be specific — I got off the Fung Wah right at 03:00, and barely snuck on the 20:30 return bus. I didn't have a place to stay, and there were surprisingly few places to sit (other than the ground), so I spent most of the time on my feet, with camera in hands. I haven't done a whole lot of street photography, primarily because I'm on the bike all the time, so it was a nice change to my normal way of doing things. 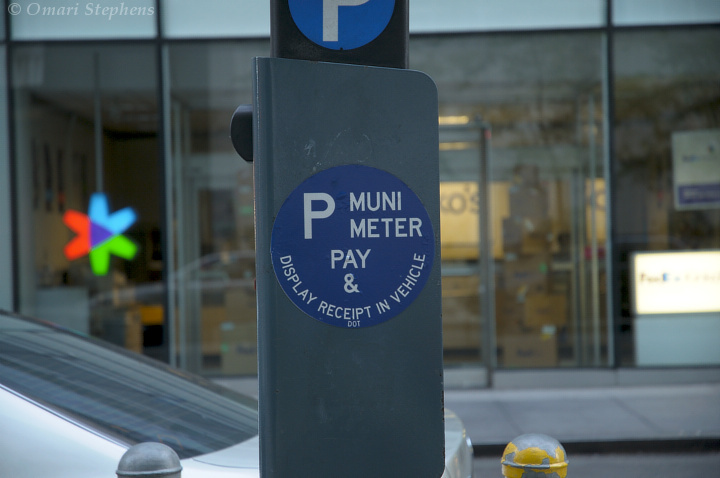 Just a quick note: Since the photos are large enough to really break continuity, this post will be a series of vignettes which will loosely form a story, a journey, a tour through Manhattan. Enjoy. I shot this image at just about 05:30. I really like it (you will see this theme emerging ;o). After I got off the bus in China Town, I took everything out of my pockets, put on my hoodie, and tried not to look like someone to be taken advantage of. Not really knowing anything about NYC, I walked down Canal Street until I hit Broadway, and then turned right. Fortunately, I had a hunch that there'd be a map in the subway. After figuring out the street numbering scheme, I went back up to street level and walked, and walked, and walked until I was at 46th, which is near where I would be meeting some friends for lunch. After failing to find the restaurant, I wandered around a bit, went down a side-street, and saw this brilliant reflection. 1/15s at f/2.8 and ISO800. I actually shot this image 20 minutes before the above one, around 05:10. I think this was on Broadway or 6th Avenue, and likely within a few blocks of 34th Street. As I walked from China Town toward 46th, I noticed that folks seemed to just be heading home from various parties. 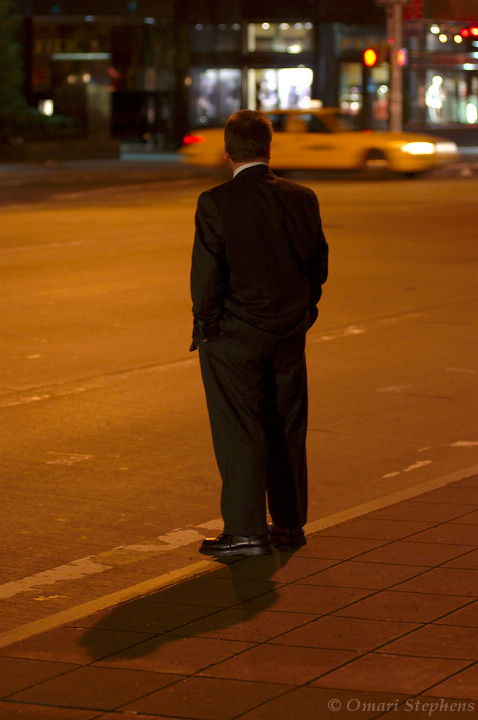 As I kept moving uptown, I noticed that there were more folks in suits, trying to catch cabs; no idea if it was nighttime or morning for them (probably the latter). This was 1/15s at f/2.8 and ISO1250. For this trip, I used Auto-ISO a lot for the first time. It's a really useful feature, since it let me set the slowest hand-holdable shutter speed for me (1/15s with my 80-200), and then maintain that minimum speed while also keeping my desired exposure (-1.3 stops for most of the early morning). Hi! It's me! This is the first one up here so far, but I really like shooting self-portraits, so there'll undoubtedly be more to come. 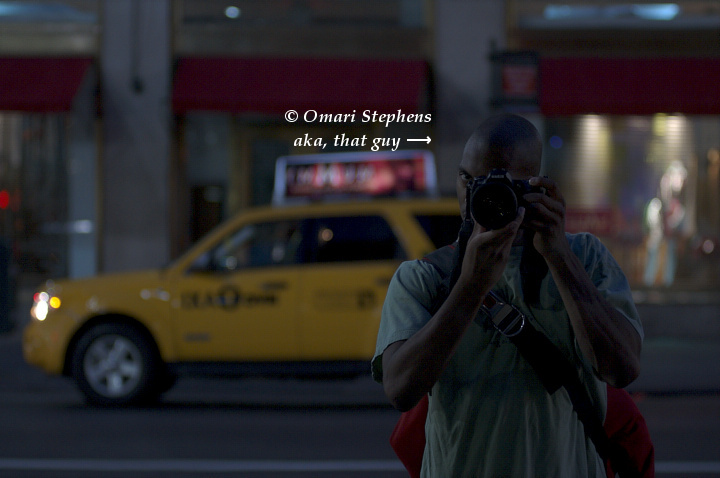 I shot this at 05:35 on 6th avenue, a few blocks uptown of 34th street. Exposure was 1/15s at f/2.8 and ISO900. For you hand-holding doubters out there, this was at 80mm (120mm 35mm-equivalent) with no VR. Anyway, the walking had caused me to warm up to the point of taking my hoodie off. Also, it was starting to get light out, so I figured I didn't need to look quite as sketchy to stay safe. I was surprised at how many of the cabs were small SUVs. I had been to New York before — my dad grew up there — and the vast majority of the cabs were Crown Vics, interspersed with a few mini vans. Interesting. I shot this at 06:15, shortly after finding my first rest, just down the street from Engine Company 65. As a quick aside, at The Tech, I think I shot and published more photos of fire engines than any other Tech photographer in recent history. I'm not sure exactly what I like about this photo, but at least part of it is that it seems to embody so well what I saw of New York during my visit. I'm not sure. I really like it, though. And as I was sitting next to the giant, curved-wedge-shaped building, it was literally staring me in the face. 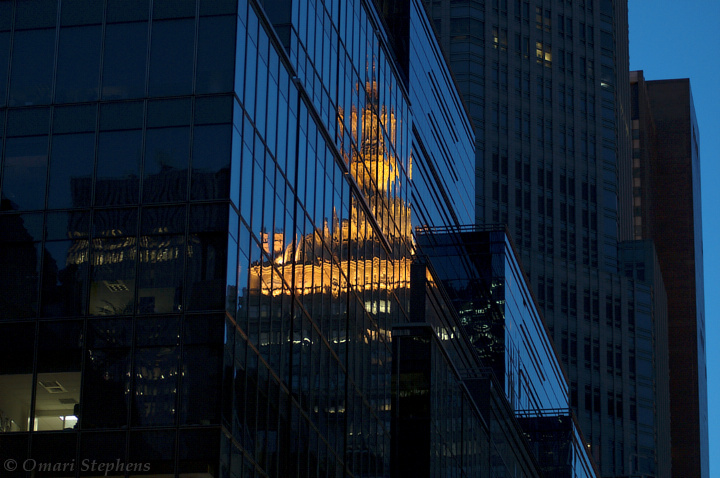 Oh, and by this time, it was starting to get bright enough to pull out my 18-70 and shoot some wider shots. This was 1/15s at f/4.5 and ISO400, at 70mm. There are some quirky things about New York. Like this door. 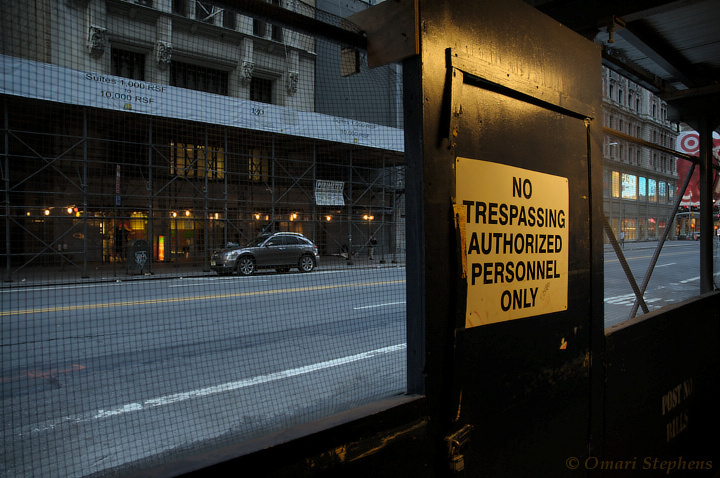 I think this was on 34th street, between 6th Ave. and Broadway. 06:30. The peculiar thing is that this walkway was basically an enclosed part of the sidewalk (because of construction above), so I'm pretty sure I wasn't trespassing. And there were plenty of vehicles on the road, and I'm pretty sure they weren't trespassing. I guess only authorized people were allowed to take this shortcut, and the rest of us had to walk out of the tunnel 20 feet down and cross the street there? Or maybe there's a tiny closet right there? Who knows? I really like the colors in this photo, especially the contrasting glow from the small (fluorescents/arc lamps) inside the tunnel, and the bluish daylight outside. Exposure was 1/40s at f/3.5 and ISO200. It would have been awesome to get a photo of someone on the outside of the door, but I was on the move to who-knows-where, and there weren't many folks around, let alone folks who were avoiding the sidewalk. Oh well. It's interesting, because I only ran into two of these. And I presume a lot more people die on bikes, what with people getting doored, people riding the wrong way, etc. 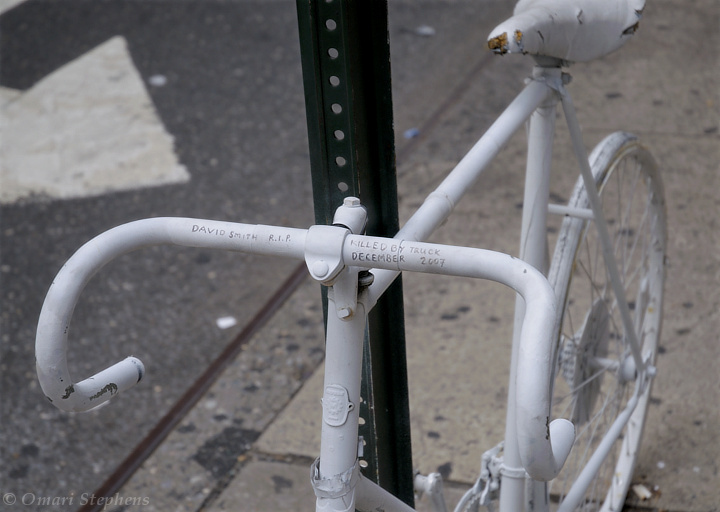 Neither of the bikes was damaged, so I presume they were meant solely as tributes, and weren't actually involved in the deaths of the people mentioned (David Smith for this bike, and Alvaro Olsen, April 16, 2008, for the other one). Exposure was 1/320s at f/5.6. Every journey comes to an end, and fortunately, the end of my trip to New York saw the capture of one of my favorite images I've taken this year. 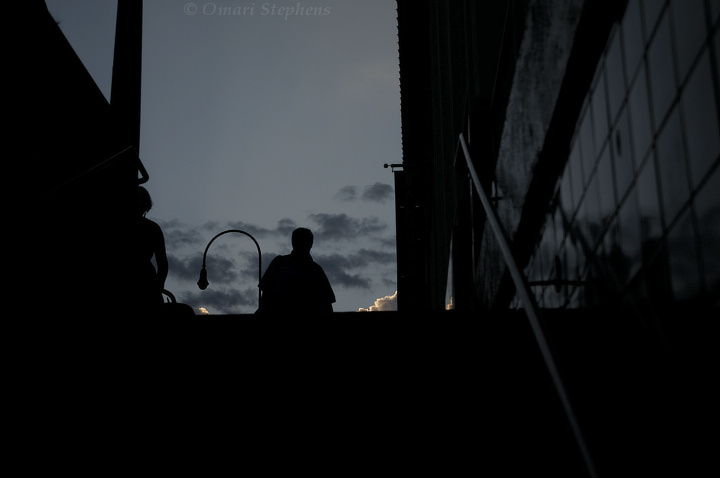 1/5000s at f/4.0 and ISO200, and shot at 23:15. As with many good images, there was a great deal of luck involved — I was on center-weighted metering, and the camera clearly exposed for the evening sky That's not how I would have done it, but man, am I sure glad that's how it happened. I'm not one to title photos. I've got fairly lofty standards for what sort of name goes with a photo so that it adds to it without being too witty, trite, or just detached. The title for this was obvious, though. It's called "Subway". That's it. I hope you see the same beauty in that name with this photo that I do. "The premise of LensWork is that photography is more than mere craft. Photography is, or can be, a way of life."